I had a lovely evening today. Just like old times it was just the three of us at the dining table. My mother, my sister and I. We were having a simple khichri-sauce meal prepared lovingly by my mother. Post dinner we sat in the hall trying to work on a common thread of conversation when I spotted the big blue bag that had been seeking my attention for some time. Now this blue bag was no ordinary bag. This blue bag which I found lying in one of my kitchen cupboards just a day before, contained years and years of emotions, a whole plethora of memories waiting to walked through. It contained greeting cards all addressed to me all those years ago. I soon started taking them out, reading and then handing each over to my mother or my sister. There were old birthday cards given mostly by my family – by my mother who never forgets to give me a card on my birthday and who adorns it with her beautiful handwriting both in English and in Gujarati. From my sister whose cards either have hastily written one liners or long undying stories of sisterly love (we had a good laugh!) Cards given by my cousins extending good wishes and holding out sweet promises to always being together! Little did we know at that time how our paths would get diverted into different directions depending on personal and family priorities. I also found several cards and letters given by my ‘then-boyfriend’, ‘now-husband’, the innocence and pettiness of which kept me entertained for a few additional minutes! Among the birthday, romance, wedding and the baby arrival cards, I had two best finds. One was a really old inland letter dated in the year 1964, written by my mother whose family was stationed in Ahmedabad at that time, and sent to my father who was living in Mumbai. This letter was written two years before they got married and was addressed to my mother’s elder brother to be hand-delivered in full secrecy to my father!! Though it is unfair to give out the details publicly, it is such an adorable proclamation of undying love by my mother that I had to write about it! The words, the tone used, by this young girl who was obviously missing her fiancé and who was trying to patch up things after a recent lover’s quarrel, was too sweet to read! The best part was because it was written in Gujarati we had to ask my mother herself to read it! It also had a line requesting my father to tear up the letter after reading lest it falls into wrong hands! 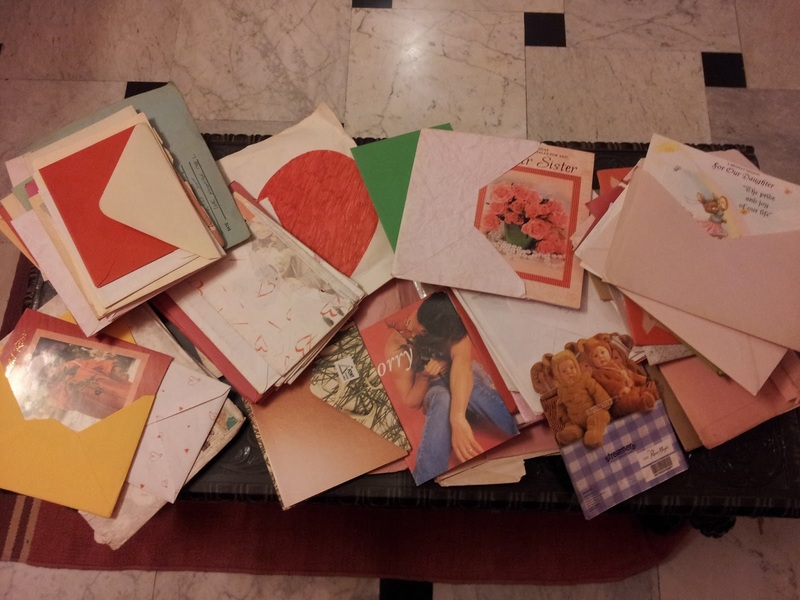 Well…..I know what’s going to happen to my love letters one day! 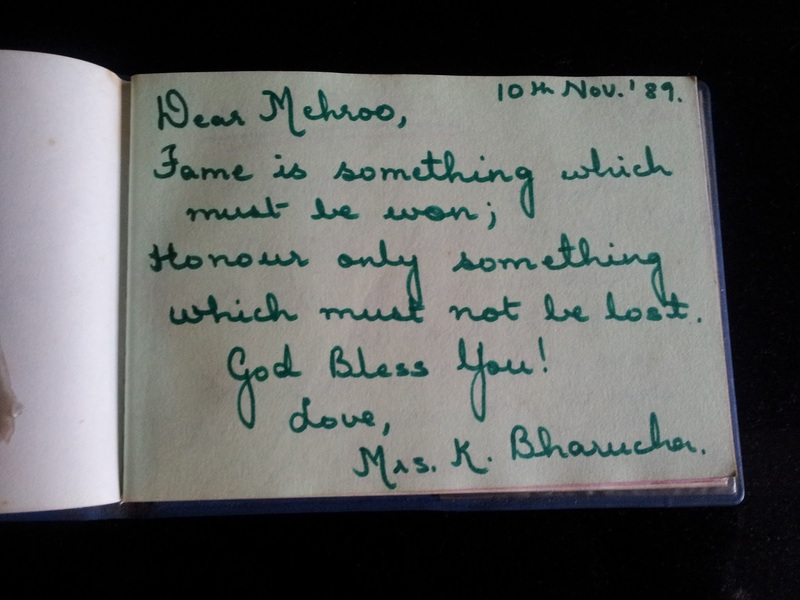 The other best find were the autograph books from my school days. 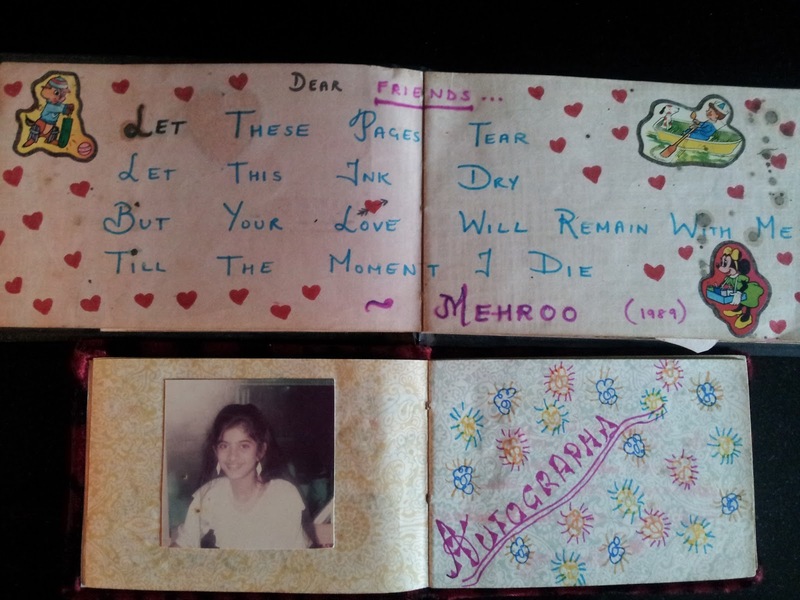 During our last year in school 1989-90 we girls carried around these autograph books making all our friends write in it. Going through them was such a delight. All those innocent “dated forever” messages and the promise to always be in touch showing heart images! What’s more I also found a separate autograph book signed by my teachers! This book had different colour pages and I remember how I would choose a colour for a teacher depending on my fondness for her! Pink was given to my most favourite ones only! It’s a pity I can’t meet my old teachers now like I used to till a few years ago, as most of them have either retired or now resting in heavenly peace. The love, the magic can only be created and re-created through the touch and feel of traditional pen and paper. The joy of writing followed by the joy of giving and then waiting to see a smile, a look of surprise or a burst of laughter, on the face of the receiver, is unparalleled! I wish to thank all my family and friends for all these wonderful memories. Memories that can be re-lived again and again. What a wonderful way to spend an evening!